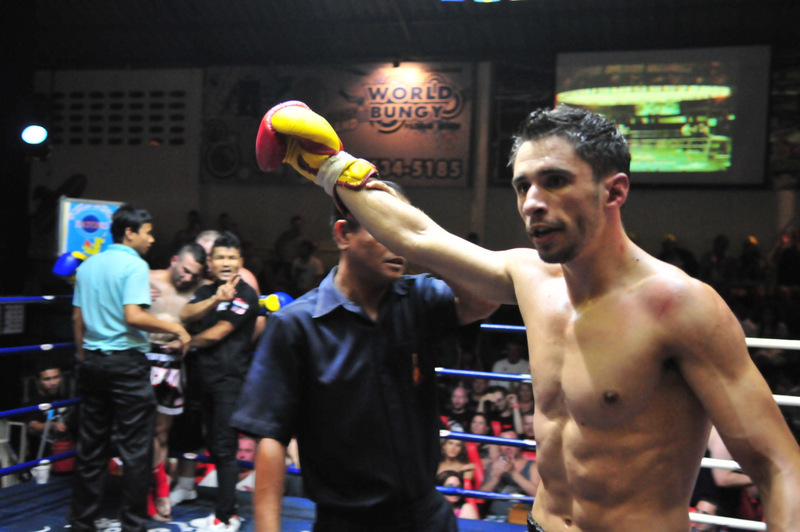 Tiger Muay Thai and MMA Training Camp’s had a great showing at Patong Boxing Stadium Monday night as veteran Jonny Betts and newcomer Alex Danilo brought home knockout victories. Betts, a 24 year-old England-native with nearly 20 fights on his record, battled against Roongchai Por Tawatchai of Thailand. Betts started with a succession of jabs that kept Roongchai at bay for much of the first round. He pushed the pace the entire time and landed several knees to the body, working the Thai’s midsection with strong hits. By the second round, it was obvious that he was feeling the pressure. Betts continued his assault with knees and finished Roongchai with a perfectly placed elbow shot to the chin as the Thai went for a punch. The knockout caps a three-fight win streak for Betts, who came back earlier this year from a leg injury that put him out for 18 months. The streak includes a win in Bali, Indonesia just one month ago. Meanwhile, Danilo entered the ring for his third fight looking to avenge his last bout that ended with a loss. Danilo came out with a good right kick to the head and ended the first round with a strong punching exchange. Danilo’s opponent, 20 year-old Slate of the USA, was winded by the middle of the second round after Danilo kept picking off punching combos. He hobbled Slate with a strong cross then gained the upper hand while in the clinch, controlling his opponent to gain a devastating knee strike to Slate’s head which dropped the American. Just moments later, the 26 year-old Romanian finished off his opponent with similar set of moves.